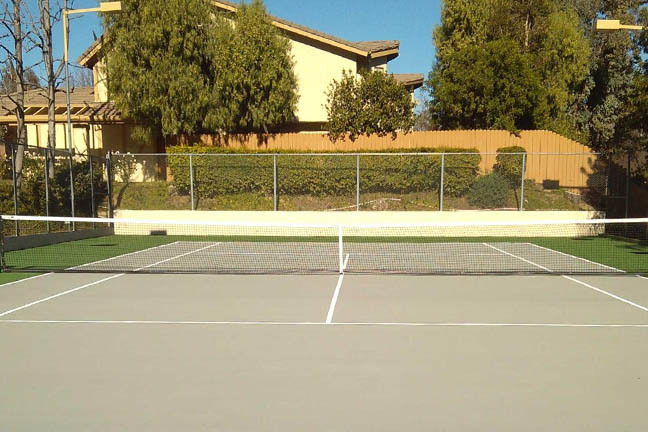 This backyard court is great for Tennis, Basketball and so much more... We specialize in a wide variety of court surfaces, clay, acrylic, grass, concrete, you name it. 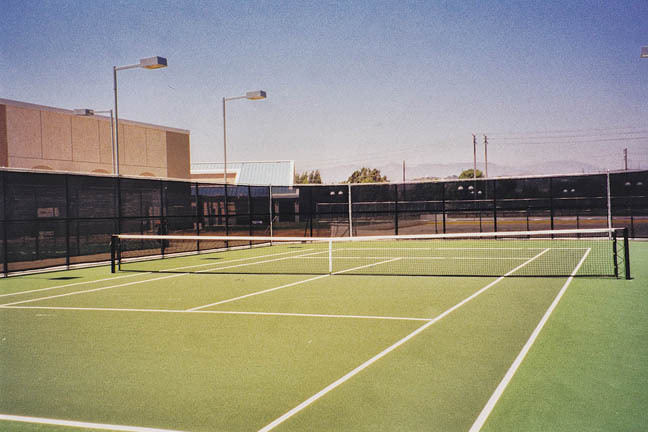 Acrylic Tennis Court The game of tennis just gets better when played on a professional, quality court. 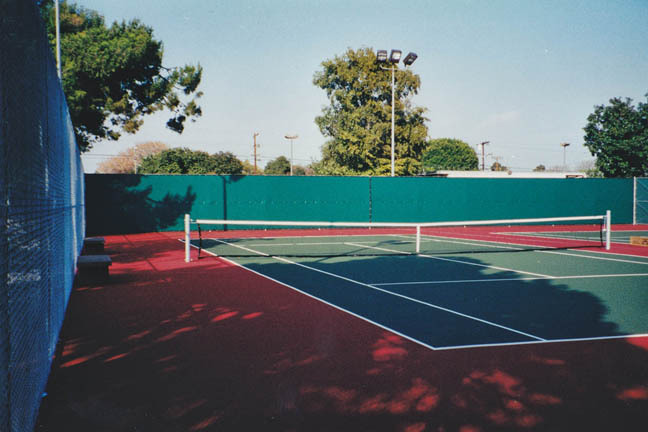 Neighborhood Tennis Court This is a great example of a neighborhood tennis court, complete with court, shaded scoring and viewing area, fencing, lighting and more. 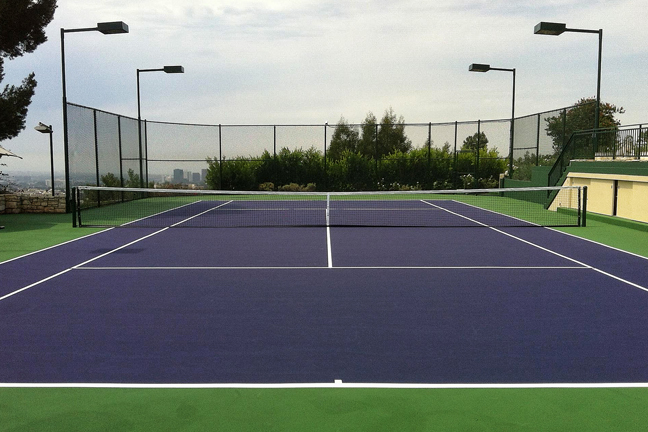 Ready for yours... please contact us today and we'll get your fun done! 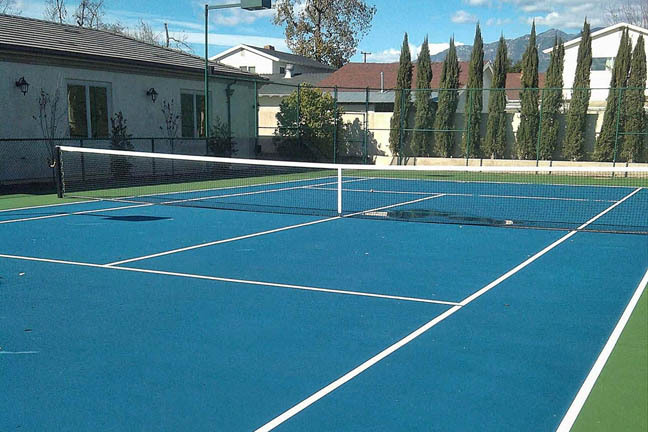 Residential TenniS Court Blue court surfaces continue to gain in popularity. 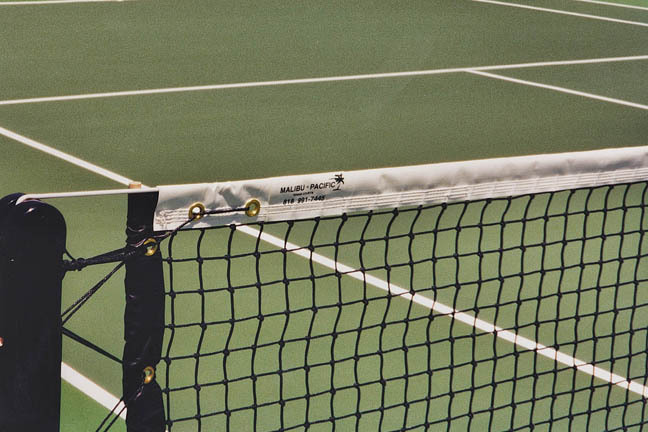 This is one of our more popular color combinations and makes for great play and ball visibility. 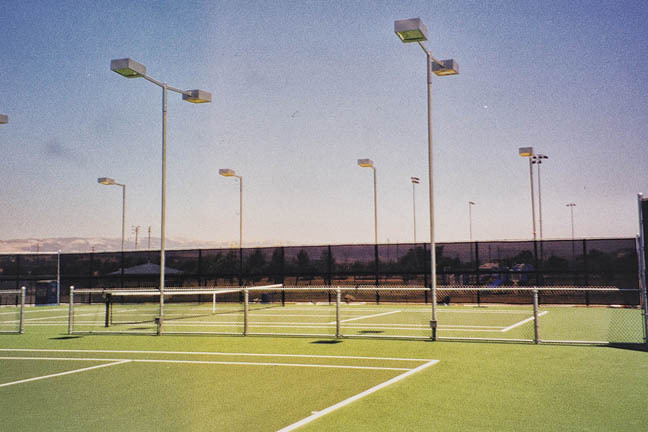 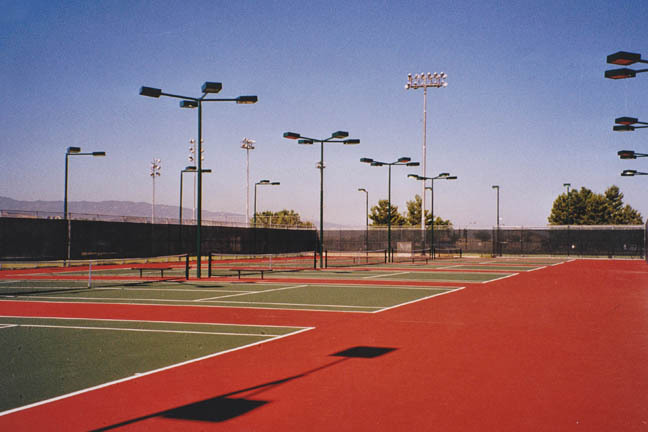 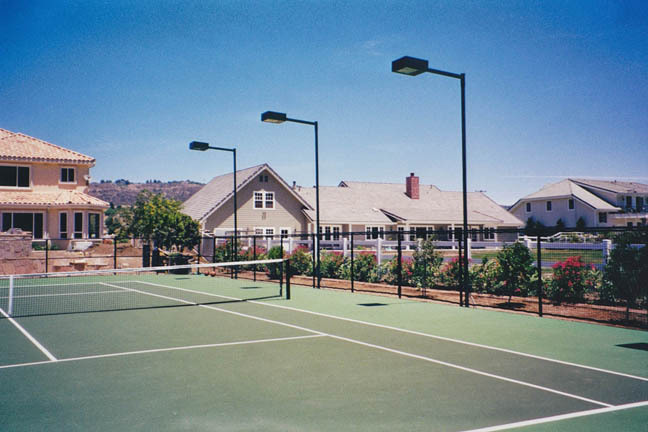 Community Tennis Court Court, court fencing, and outdoor lighting complete this court project. 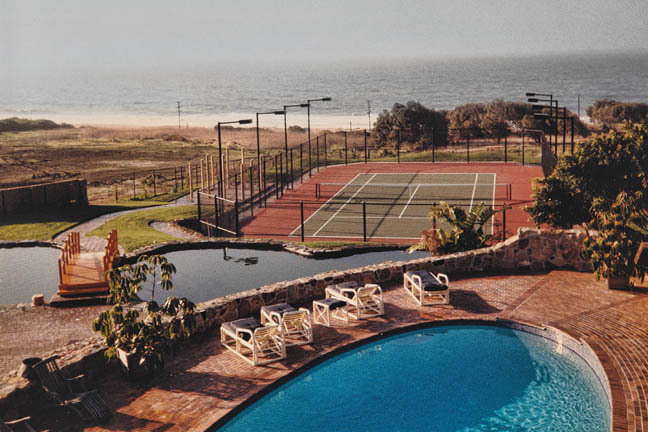 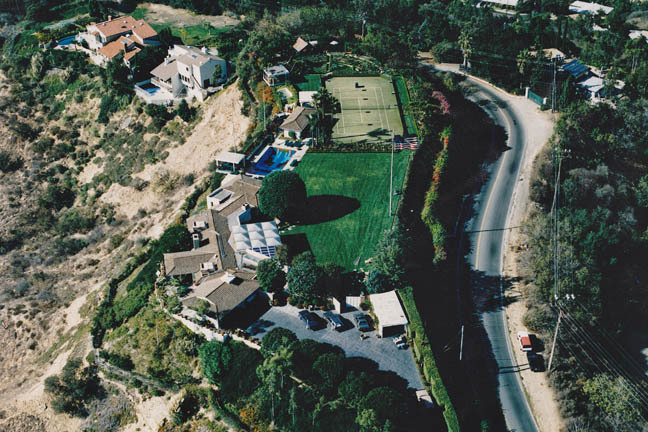 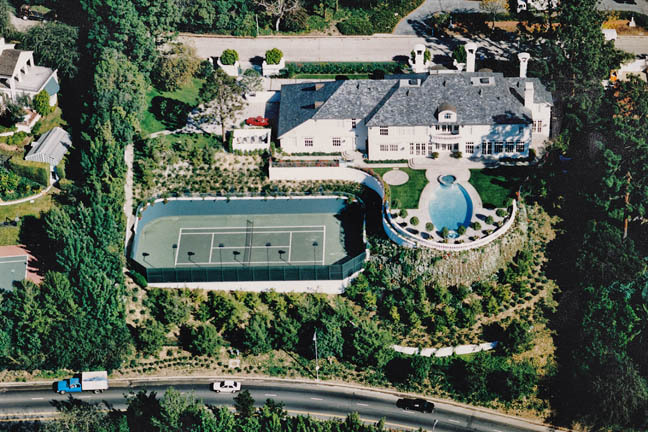 Swimmg and Tennis by the Sea Right on the California Coast of Malibu, we built this amazing backyard swimming pool, tennis court, pond and bridge complete with outdoor lighting, fenced in court and so much more. 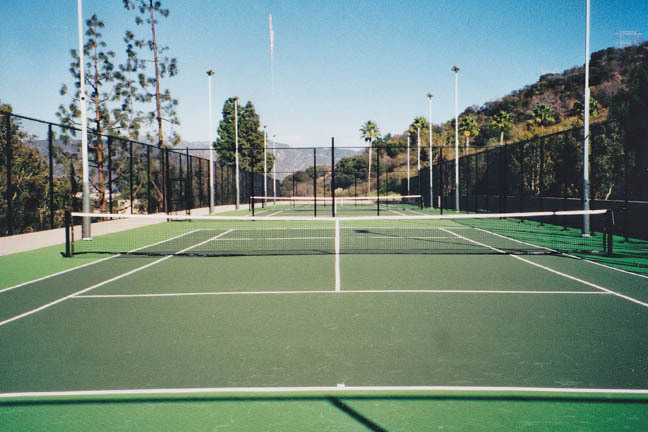 Residential Tennis Court This is a beautiful backyard tennis court that makes the home feel even more like you are at the country club. 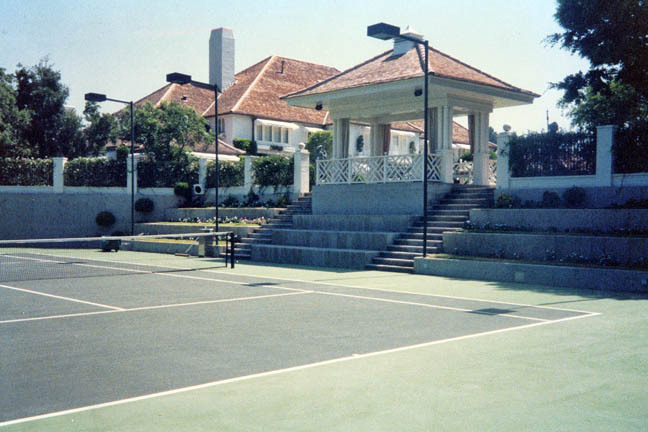 Residential Tennis Court The classic styling of the gazebo and shaded viewing area complete the look of this backyard tennis court and facility. 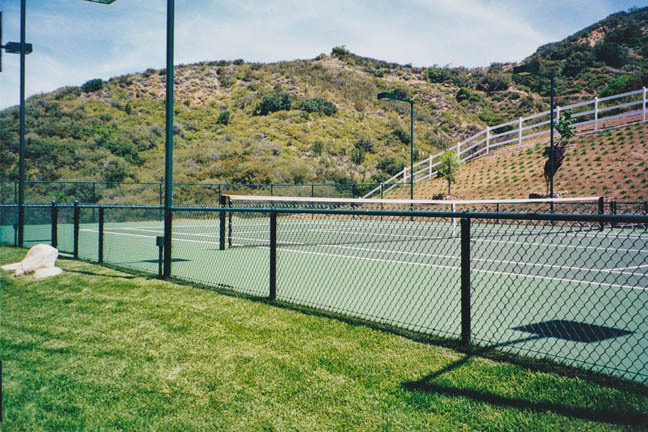 Tennis & Game Courts This is a close up look at one of our many court fencing options. 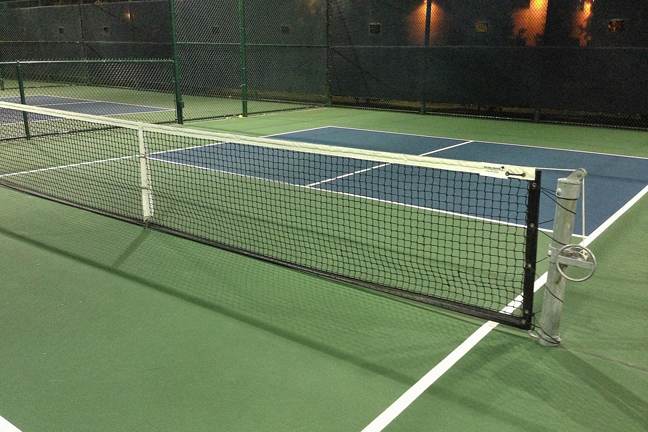 No more chasing balls! 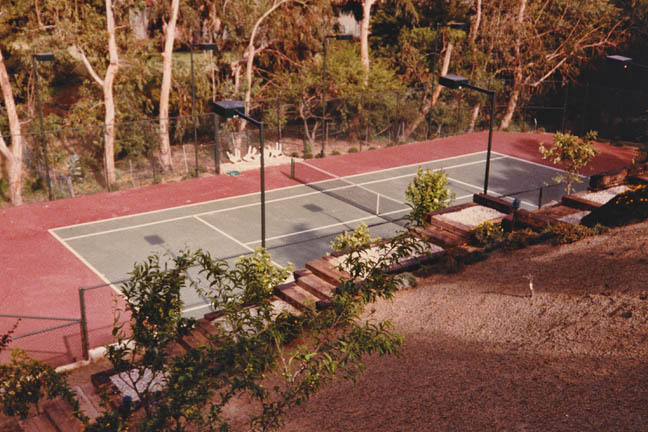 Residential Tennis Courts This tennis and basketball court also utilizes storage buildings and catch fencing, complete withy outdoor lighting for nighttime play. 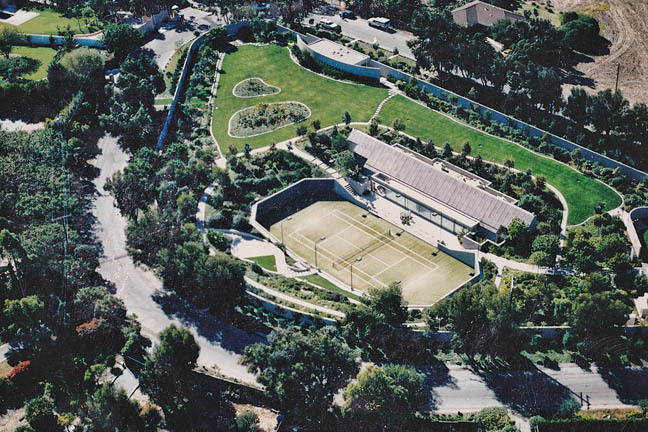 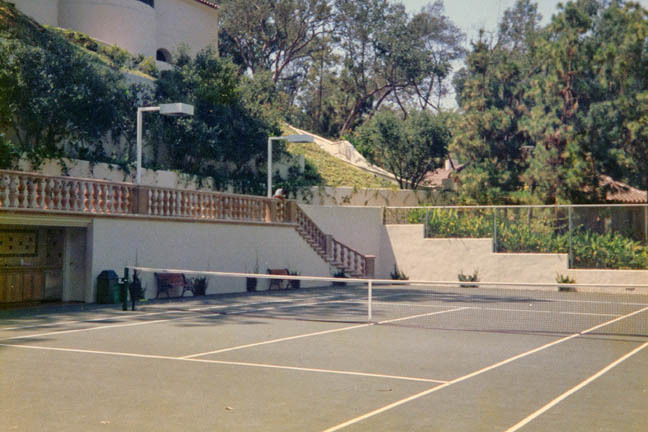 Johnny Carson's Grass Tennis Court - Malibu, CA This grass tennis court was originally built for then Tonight Show host Johnny Carson. 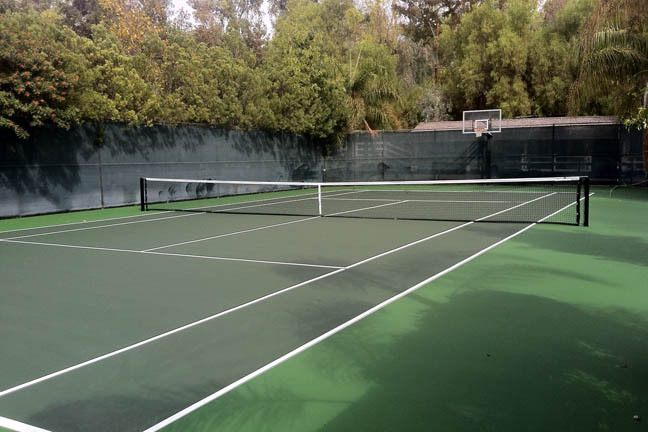 Tennis Court, Basketball & Swimmg This home has it all, an impressive tennis and game court facility, basketball half court and a beautiful swimming pool and sun deck. 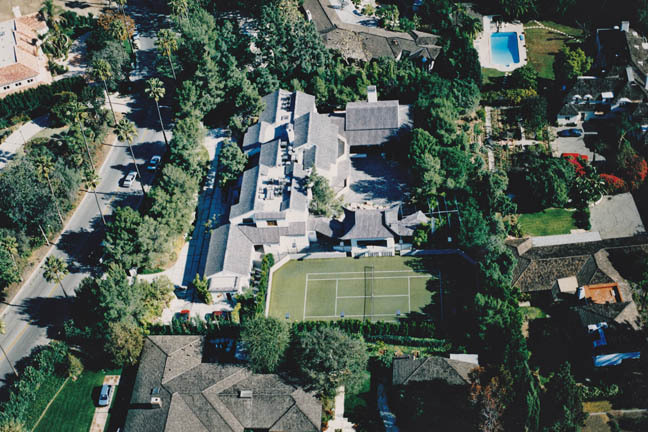 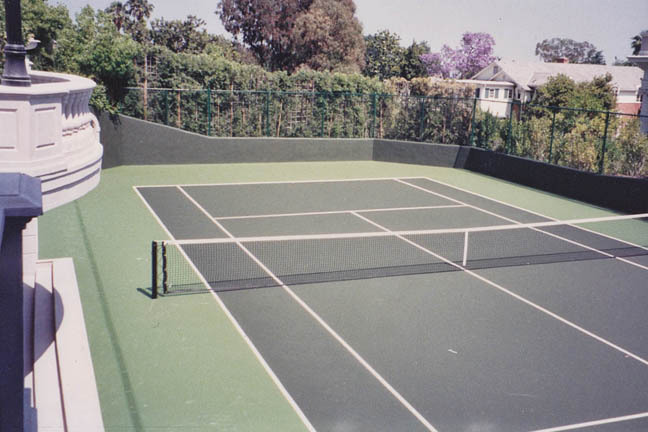 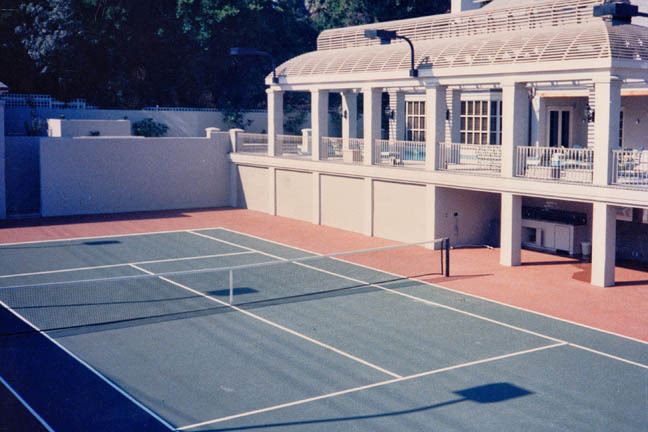 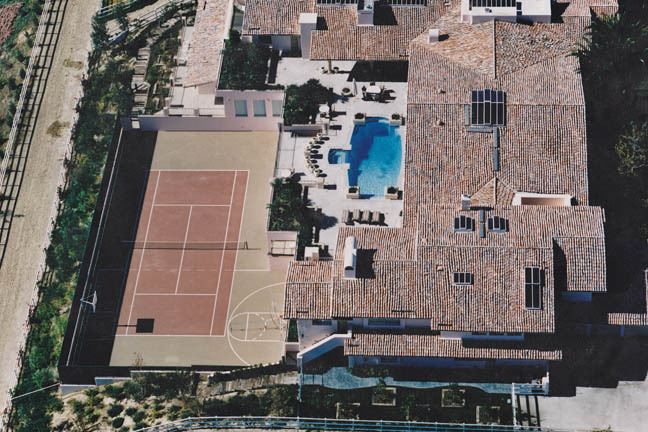 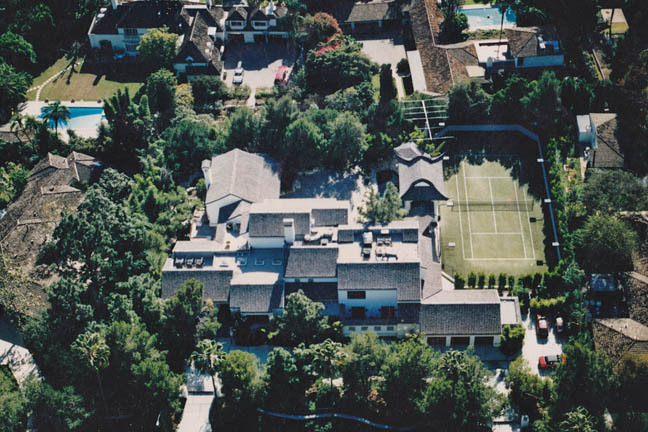 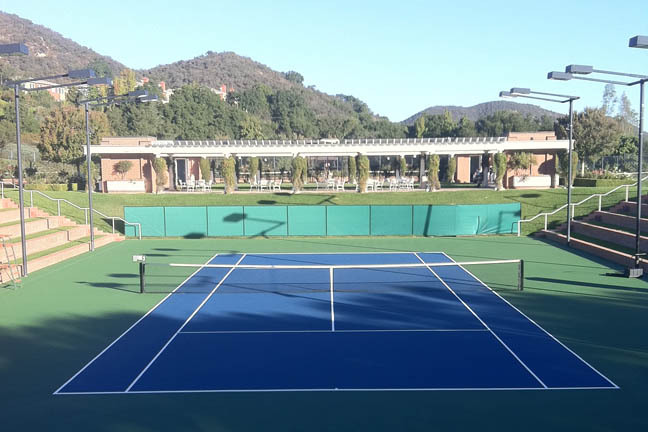 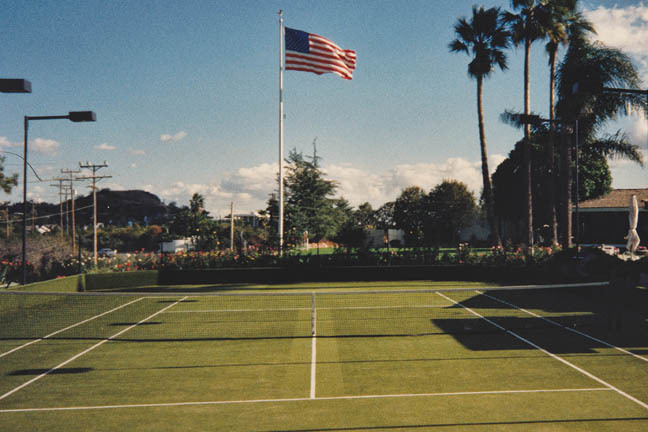 Synthetic Grass Tennis Court - Beverly Hills, CA This Beverly Hills home has a grass tennis court we made from synthetic grass. 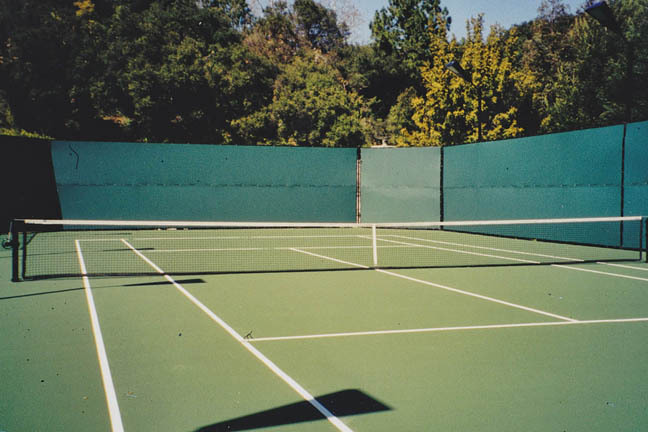 It sports all of the good looks and play characteristics of a grass court without all of the upkeep. 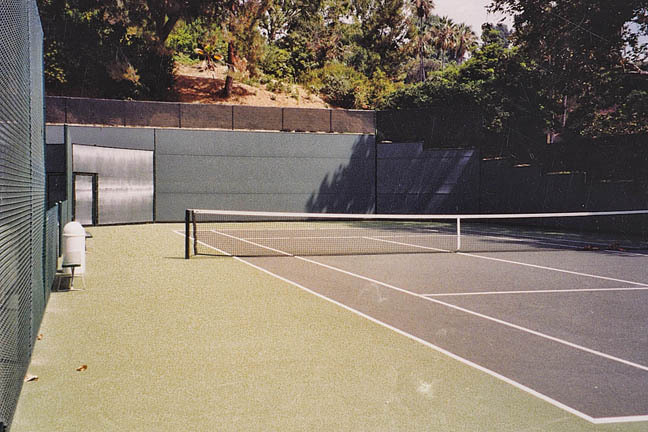 Beverly Hills Tennis Court Synthetic grass tennis court in Beverly Hills, CA. 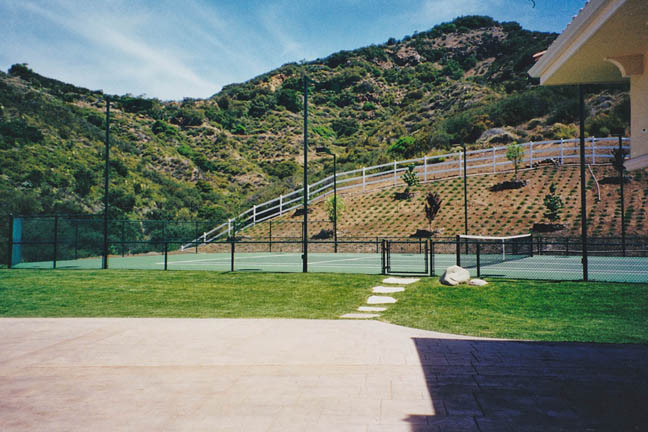 Tennis Court - Beverly Hills, CA This hillside tennis court proved to be a great way to utilize the hillside and turned it into useable court space. 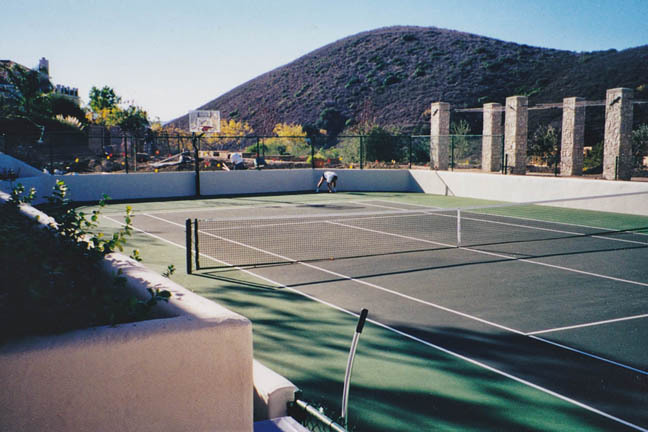 Agoura Hills Residential Tennis Court Tennis Anyone? 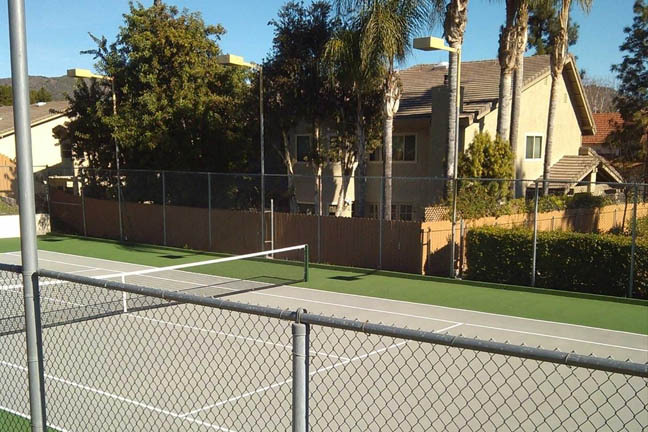 This is a great example of how the simple addition of a basketball hoop to your tennis court provides even more hours of family fun from your court. 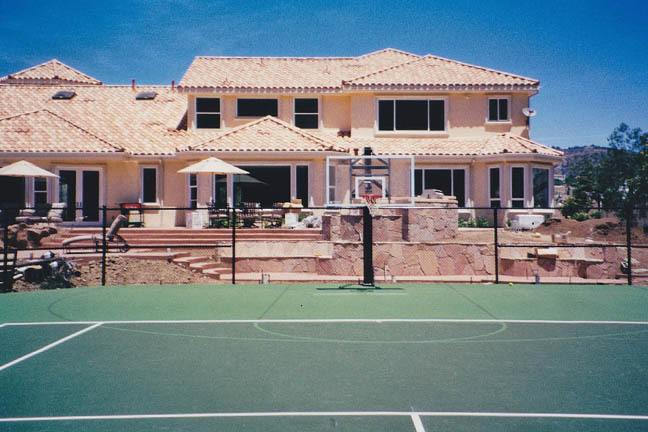 Tennis is great, but if you like more than 1 sport or you have kids, the addition of a basketball hoop can really add to the hours of enjoyment your family and friends will get from your court. 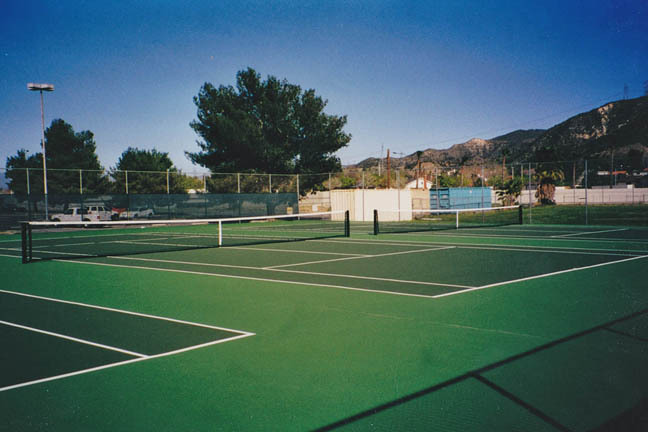 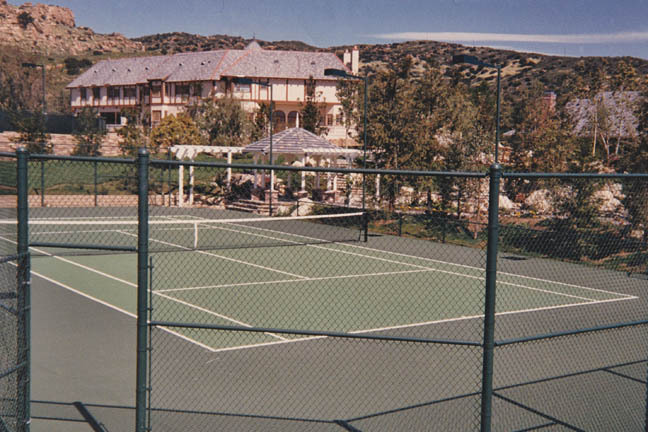 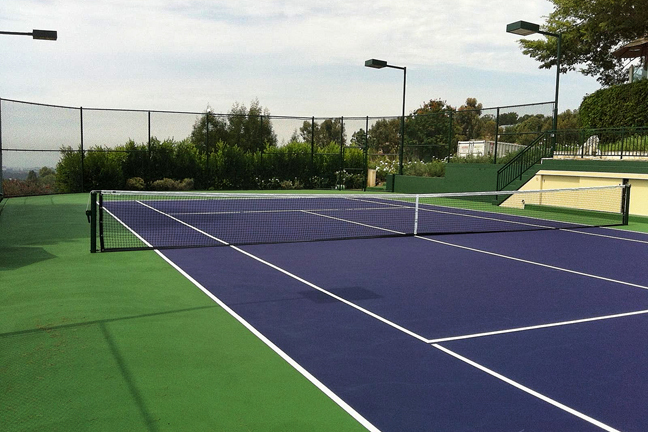 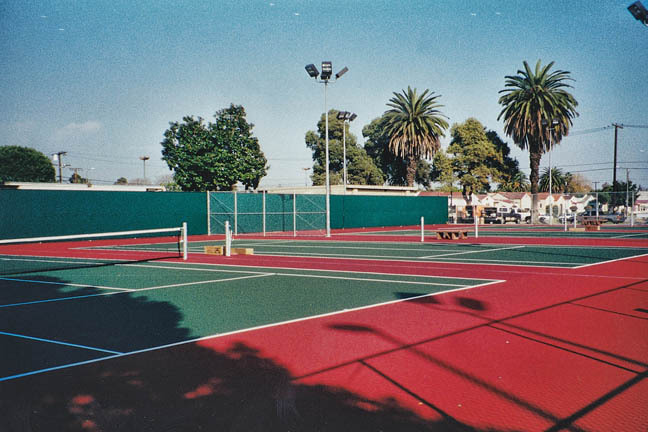 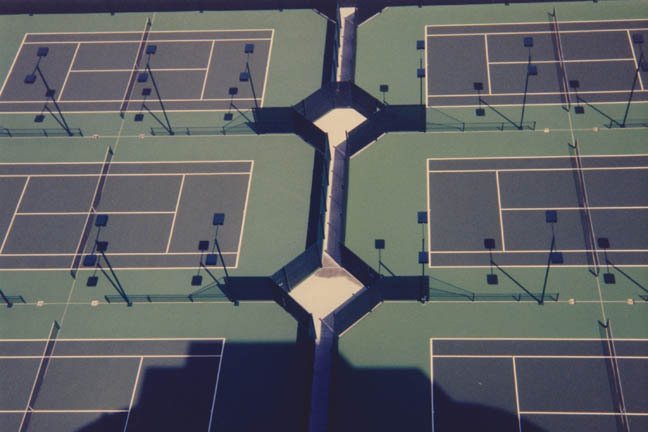 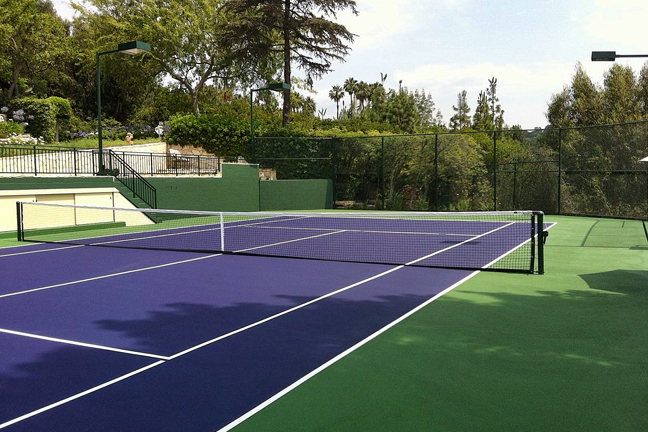 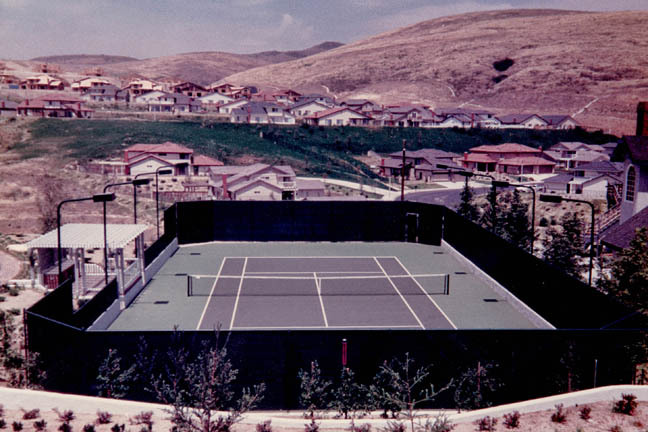 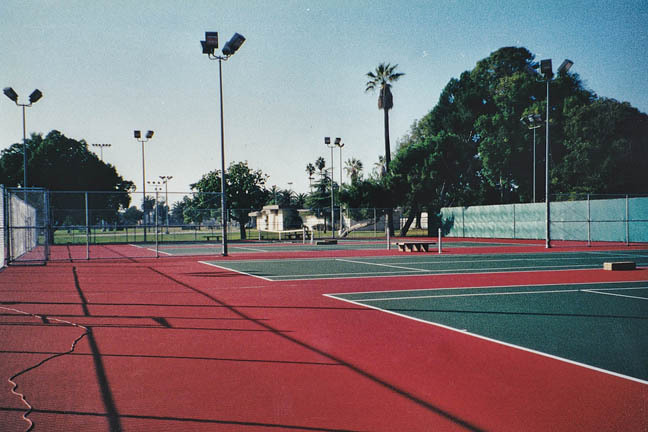 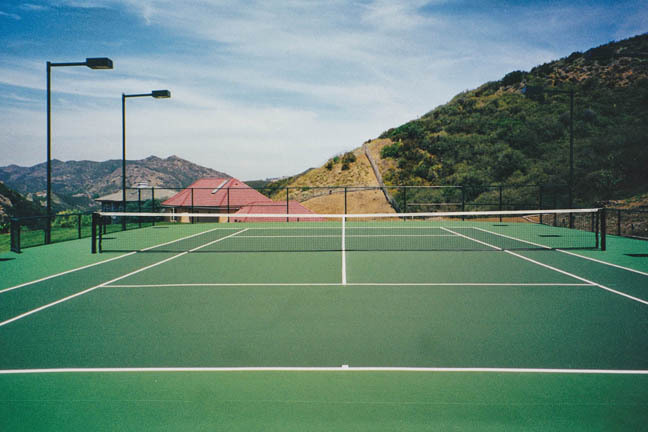 At Pacific Tennis Courts we have been creating the perfect tennis court for any size match for more than 40 years. 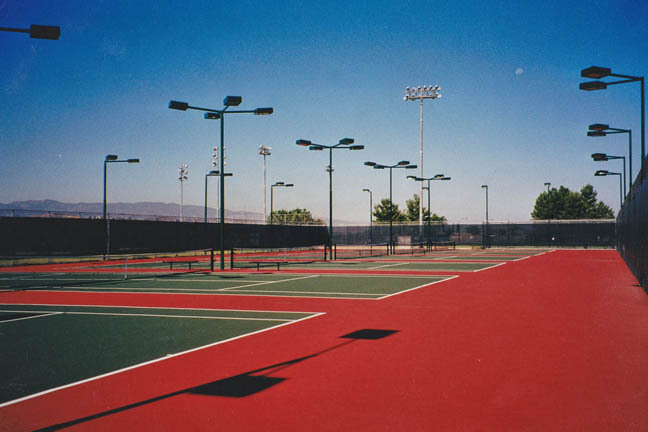 Whether you prefer to play on a more traditional surface like clay or grass or on the more modern concrete or acrylic courts, we do it all and we do it right. 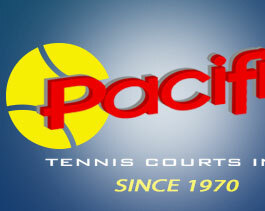 When it comes to experience, you'll be hard pressed to find any court builder that has been in the business longer or built a wider variety of courts than Pacific Tennis Courts Inc. We have been serving the south west since 1970 and attribute our longevity to offering the best products on the market accompanied by top quality customer service. 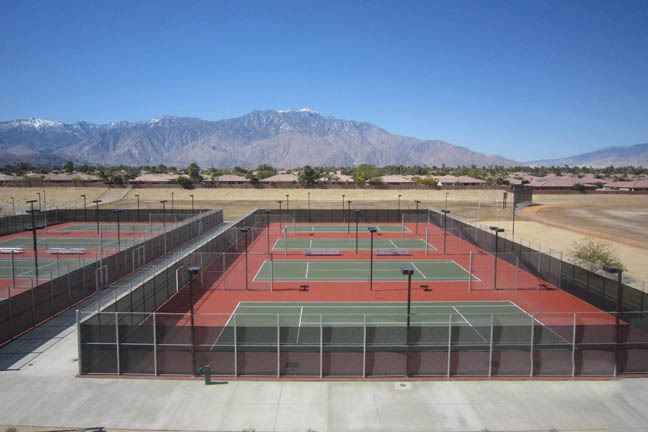 When thinking about your court project, many people don't consider all of the other items that go into making your court area or facility great. 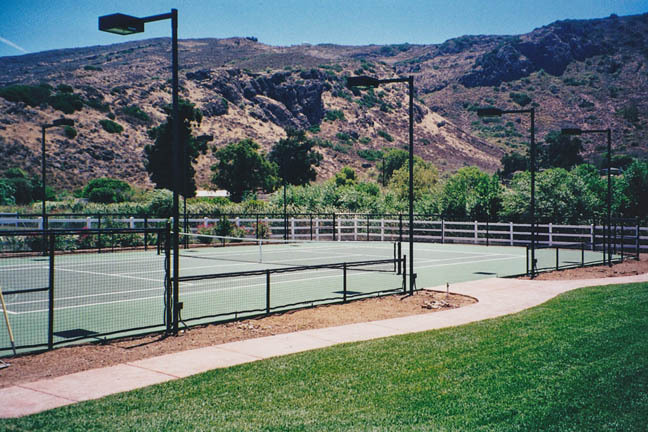 Beyond just creating the court itself, we are a full service contractor specializing in everything your project needs including: lighting, gates and fencing, sidewalks and patios, seating, benches and bleachers, out buildings, restrooms, and snack bars just to name a few. 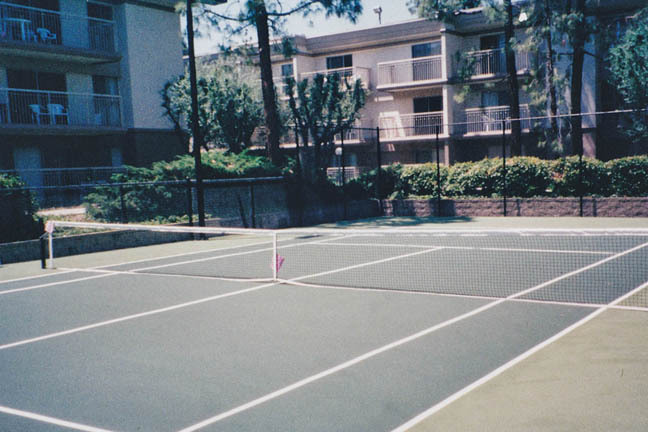 Of course, you don't have to do any of these things, but imagine the possibilities. 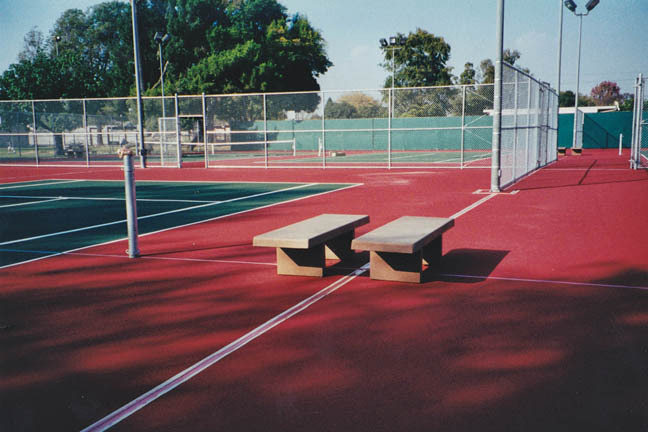 Check out our Contractor Services page for a closer look at some of these projects. 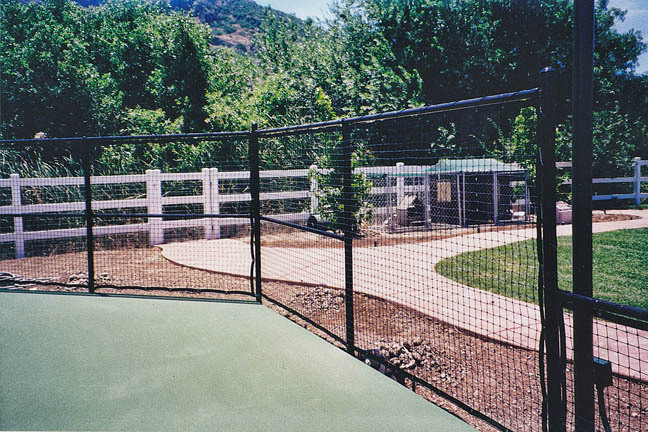 Lets face it when you start any project what you really want is the best product available at a fair price. 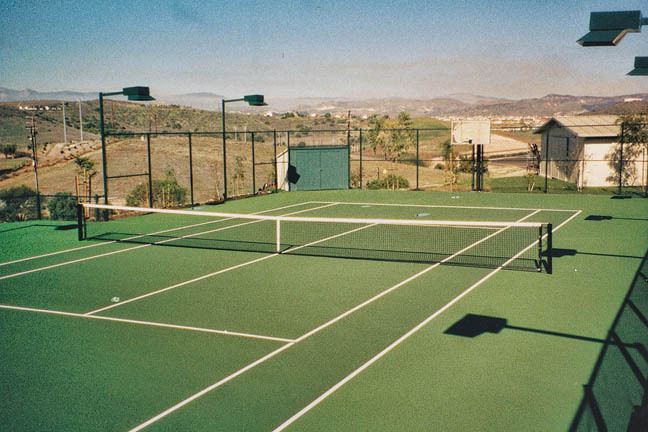 There are plenty of companies out there that offer the latest gimmicks or will do anything to be the lowest bid, often resulting in overages prior to the completion of your job, and many times a finished product that just isn't what you had hoped for. 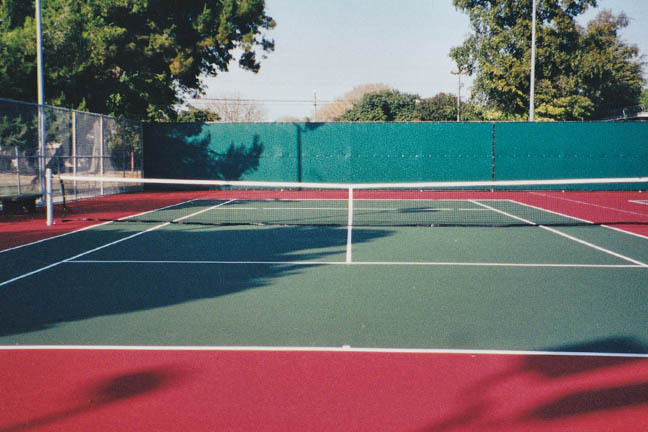 Not here, we offer a wide variety of court options, all of which are top quality products sure to get you a finished product that lives up to or even exceeds your expectations. 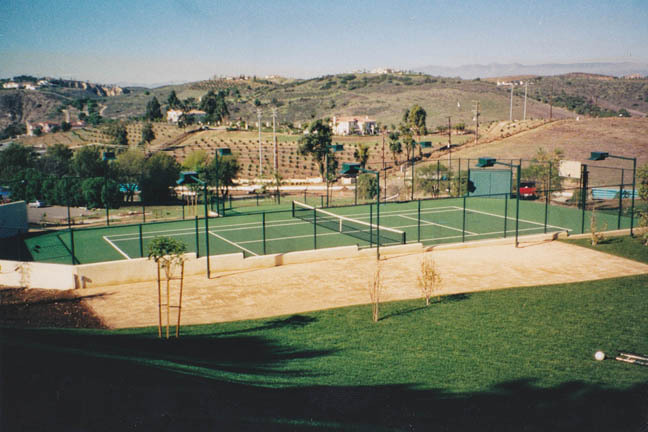 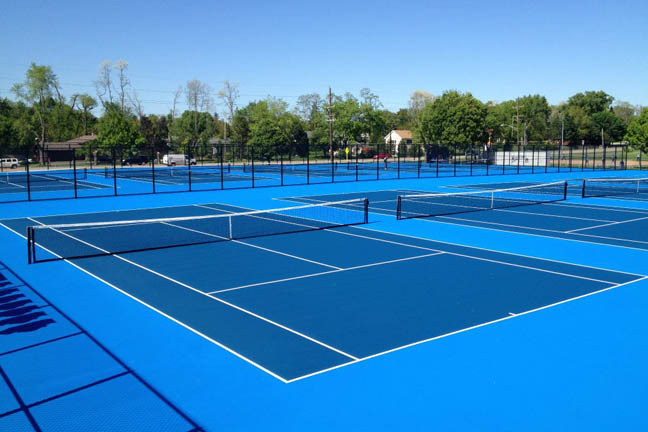 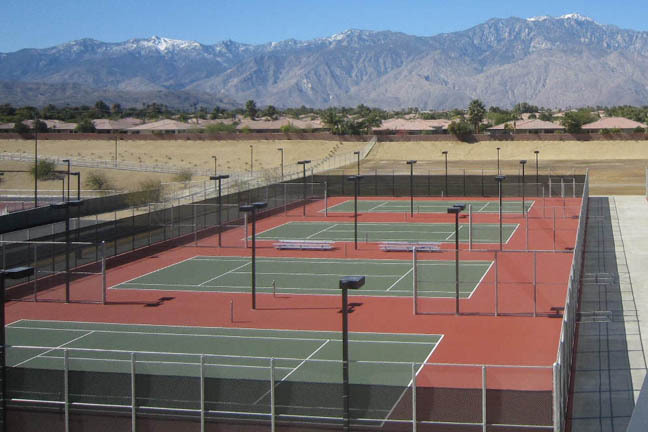 Whether you're building a court in your backyard or are starting construction on a world class tennis club, we are simply the right choice for the job. 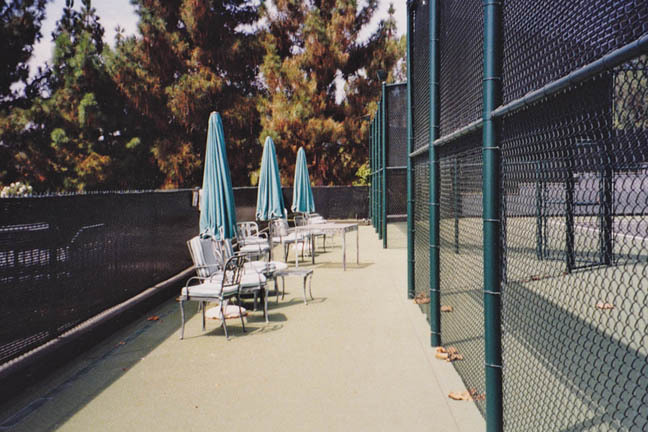 Check out our extensive list of references. 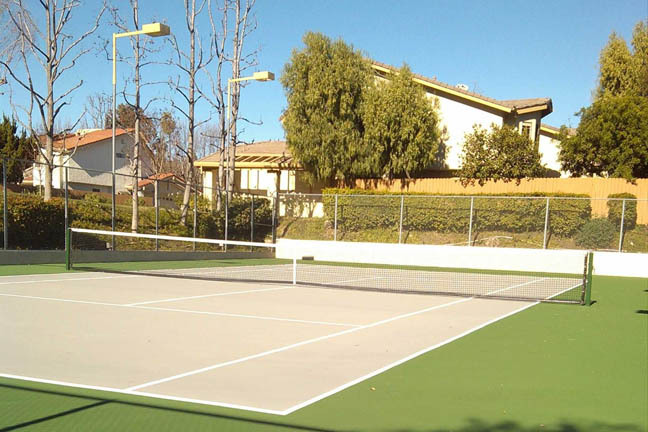 Interested in ways to make your court great for more than tennis alone? 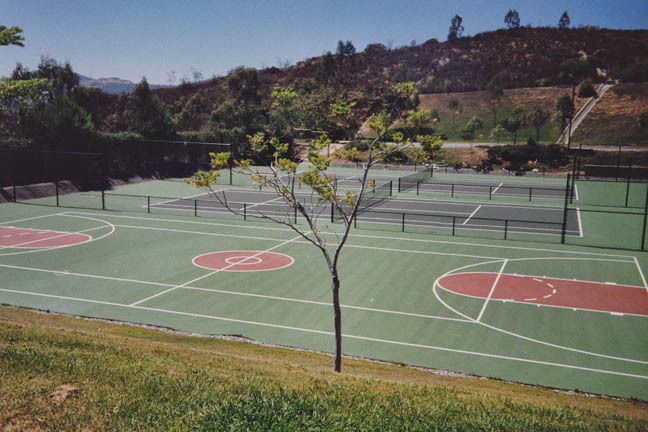 Have a look at our multi-sport game court options as well.